9/09/05 Ivette Blogs: Finally I Got HOH!!! After being a fairly loyal member of the Friendship from the get go, April Lewis made an unfriendly exit from the Big Brother house last Tuesday night. After her pal, Ivette, won the Power of Veto competition — and was a little too exuberant in her celebrating — April gave her a piece of her mind. Too bad Ivette had control over who went home and, of course, picked the 31-year-old pharmaceutical rep instead of her buddy, Maggie. TVGuide.com caught up with the recently married Texan to find out what she thought about the fight, Howie's comments about her husband and dog and what she most wants to do now. 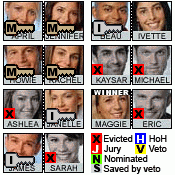 The day I won HOH was by far the best day for me in the house. I felt as if I had been crowned Miss America. After getting my HOH room I knew that I was the luckiest house guest ever. Did you see my presents? I got Ugg house shoes, fabulous housecoat, great pics of my wonderful hubby and dog, Dave Matthews CD, hubby's bracelet and lots of junk food (thanks Matt and BB). The week for me started off well because I knew that I would have the chance to possibly evict James and guess what it looks like it might actually happen if the votes pan out. It was definitely a hard choice to decide between James and Janelle going home, but I know I have a better chance going further in this game with Janelle than James. The both of them are very manipulative and competitive, but I can read Janelle like a book to where I choose not to spend enough time around James and figure him out. Sorry BB fans for having to backdoor James, but the guy is awesome when it comes to competitions and "The Friendship" couldn't chance him winning POV again. This week has been the most restless week for me. I lay in bed every night trying to speculate how to win this game and the minute I draw up a plan in my head I realize how much this game changes on a dime, so I am just going to rest and relax. Hopefully the most deserving person will win. I can't believe that I have made it into the final 6 and counting. This house has definitely taken a toll on me physically and emotionally. I wish that ever person in America could have the chance to experience this situation, it is WAY harder then anyone could ever imagine. Would I do it again? Absolutely not!! Am I happy I did it? Absolutely! My strategy coming in was to lay low, have a great time, meet new friends and take a vacation. Now my strategy is to WIN, WIN and WIN!! Stay tuned and see what happens on BB6, expect the unexpected. I love you Matt, Pepperoni, Mom, Dad, Chad and Cheryl, friends/family, BB Fans and America. Thanks for watching!!!! Come root for Big Brother 6 housemate April Lewis here! You decide. There's a few of these now and the content is lame enough it doesn't make a good prank, so it seems a believable twist.